Like most people, I became a fan of author Stephenie Meyer from her famous vampire trilogy. I think a lot of people were curios and maybe a little skeptical when she announced she had another book out so soon after the success of Twilight. My friend Sandie and I attended a book signing for The Host, curious to see if Meyer was merely just a one series wonder. I have to say that I was happily surprised to find she has more than one trick up her sleeve. The Host is a romantic science fiction story that takes place on Earth after it has been almost entirely taken over by aliens. The aliens are basically parasites that use human “host” bodies to function. Although the aliens are responsible citizens and lead pretty normal, eco-friendly, non violent lives; they are ultimately guests that have over stayed their welcome. The good news is, there are people like Melanie Stryder and her younger brother Jamie who have escaped capture and now live a life on the run. The story beings when Melanie is taken and given “Wanderer”, the alien soul that now lives inside her. Melanie is strong for a human and Wanderer soon realizes she is not in complete control of Melanie. After time, Wanderer actually begins to sympathize with Melanie and she plans to escape to join the rest of the human resistance. There’s just one small problem, you can tell when somebody has turned alien. So when Melanie/Wanderer does arrive at the human resistance hideout, she’s not trusted (to put it mildly). 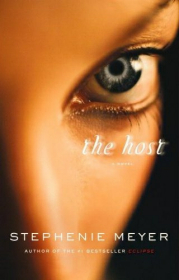 The Host is a great story about love, trust, and right and wrong. As the reader, you are often unsure whose side you’re on and who you want to see succeed. This book is a little more adult than the Twilight series and if you are looking for purely romantic book you won’t find it here. I really enjoyed this read, and I hope Meyers continues this story in the future. Buy The Host by Stephenie Meyer on Amazon by clicking here .